Marietta Silos is a nationwide leader in design and construction of concrete storage silos. We custom-build a variety of concrete silos, using our design and construction expertise to help you decide what types and sizes will work best for your application. At Marietta Silos we typically design all of our silos with the assistance of a silo engineer, which fulfills an industry requirement. It is important that Marietta Silos provides the silo engineering and design because our engineering practices fit with the method that our construction crews utilize for our Jumpform and Slipform systems. All of our silos are designed to meet the new silo design code, American Concrete Institute (ACI) 313-16: Design for Concrete Silos and Stacking Tubes for Storing Granular Materials. Marietta Silos is a member of the ACI Committee, keeping our team on the cutting edge of the latest industry standards and updates. With Marietta Silos’ extensive background in silo engineering and construction we are also an expert in silo inspection and repair. All of these talents come together as a one stop shop to handle all of your silo needs nationwide. Marietta Silos is committed to safe, efficient and effective construction and our array of concrete stave, Slipform and Jumpform silo construction techniques provide you with the silo solution that is best for you. 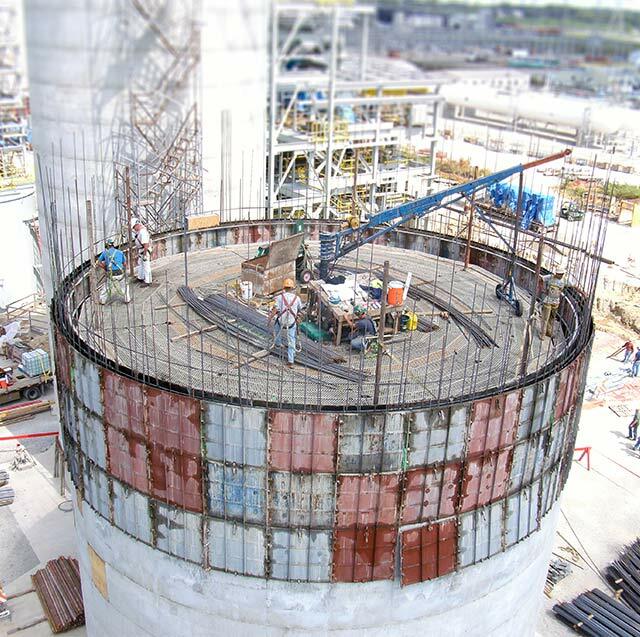 Marietta Silos also owns the Jump-O-Form construction system for safe and economical concrete silo construction. This silo construction form system is the only system that conforms to the new OSHA 125’ rules. Marietta Silos designs and builds concrete storage silos to hold a wide range of materials in a variety of ways. Each construction method has benefits which must be taken into consideration after determining the necessary size, material stored and site requirements.